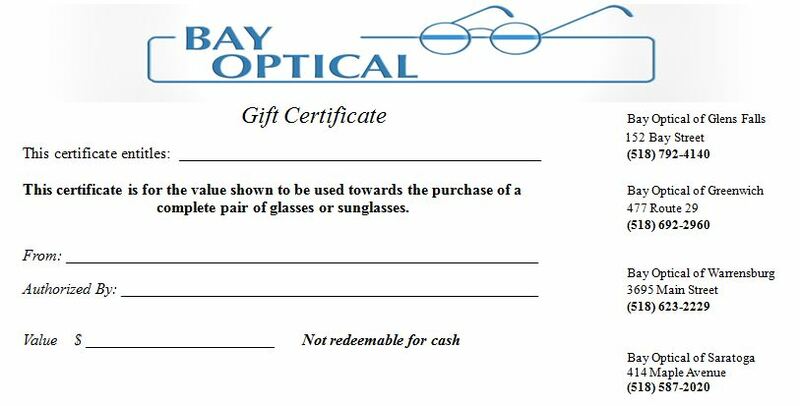 As a local business, Bay Optical Group cares about our neighbors. We will provide you with unsurpassed eye care, and are dedicated to affordability as well as quality. Bay Optical Group has been serving Warren, Washington and Saratoga Counties since 1968. Bay Optical Vision Services can offer you the best quality eye care available. From the eye health evaluations by our Board Certified Doctors, to the care given to fitting contacts or glasses by our professional staff, we guarantee you will have a great experience. To access your personal medical information (which is printable) from Adirondack Eye/Bay Optical and/or to submit a question to your doctor, log on to www.mysecurehealthdata.com. Note: Adirondack Eye/Bay Optical MUST have your e-mail address for you to access this information. If you do not provide your e-mail address, you will be unable to access your medical information electronically and without cost. NOTE: This is for non-emergency ONLY! Richard Price, O.D. | Brenda Dobie, O.D. | Theresa Gibbs, O.D. | Nicole Gaibrois, O.D. Click the image below to download and print. Bring it into the clinic to authorize.